I've written quite a bit recently about pricing and the cost of manufacturing, and I feel that I can say, with no little degree of confidence, that I "get it". Prices (generally) don't get created with a voodoo ritual, a dart-toss, or fall out of a plot to overthrow the Galactic Overlords. Usually, it's math. Just math. My old nemesis.... So, with that said, I'm going to whine a bit about how I want everything to be just a bit cheaper. Why? Well, I want an SET amp. I don't really know why I want it. Why don't I know why? I dunno. Get away from me. But I do want an SET amp. I even know which one. But -- and I'm pretty sure I've said this before -- the last 15 months haven't really resolved my underlying problem: the loudspeaker. Yeah, notice the side-step there? I went from pricing to amps to speakers. Sneaky, right? Heh. Okay, maybe not. The point, that I’m just going to wave at for the moment, is that it’s all a system. In that system, the most important relationship is the one between the amp and the loudspeaker. Buying an amp (for any reason) without having a loudspeaker to pair it to, is stupid. [Insert gratuitous smack to the back of the head here]. Bad form! Seriously. Even if that’s pretty much exactly what I’m doing. Ahem. So, I’m forced to note that it’s been a while since I’ve revisited this topic. I think the last big jag I made about this was back in November of 2011. I had just invested way too much money on my analog front-end and thought that finishing that second system with a flea-powered amp and some highly sensitive speakers would be just what the doctor ordered. But where to go? A couple of months later, I opined that there were a few things on my audiophile to-do list (aka, “want to buy” list) that might fit the bill. I had then recently picked up a pair of Tekton Pendragons, hilarious over-performers, but even though they had a really high overall sensitivity, they nonetheless loved the juice. Great loudspeakers, yes, and yes, they “do triodes”, but it wasn’t quite the match I was looking for in a low-powered reference. The SEAS-version of the Pendragon might be a viable option, and supposedly one that will actually be en route soon, but at 4 ohms and 95dB sensitivity, I’m thinking a handful of watts may not be the way to get those bad boys to sit up and bark like the big dogs I know they are. Anyway, the quest continued, and swept up a then-new design by DeVore Fidelity, the $12,000 Orangutan O/96. They’re amazingly good, and even though Stereophile’s Art Dudley has “blessed” them with the distinctly faint praise of Class B status, they’re far better than this, and far better than most of Stereophile’s so-called Class A loudspeakers. But 96dB, while tube friendly, isn’t necessarily SET friendly — my knee-jerk recommendation is for something in the double-digit watt output range. For SET tubes, that means an 845 or maybe a Kronzilla tube, just not really a 300b, and certainly not a 45. Those small-output amps would drive the O/96, but with that big woofer, I’d expect that the more powerful amps would have far more fun. Not ruling it out, though, so don’t get too sweaty. Just tossing some observations out there. The next up was the $24,000 Hørning Hybrid Eufrodite Ultimate Zigma Plus. This Hørning recently got a facelift, so buying them now is a fair idea. They’re also rather svelte, with a narrow face and a deep cabinet, so they seem maneuverable, a huge benefit for a reviewer. They’re 98dB, which is great and the bass is rather solid. I’ve heard them rock the heck out on a Thöress F2a11 monoblock, so I know they’re SET friendly, even if 2dB isn’t a lot of difference from that O/96. Interesting. Last up was something I hadn’t considered back in 2011 but sure spent a lot of time wondering about in 2012: the Volti Vittora. At 104dB, this is a made-for-SET loudspeaker if I’ve ever heard of one — and I spent six delicious weeks driving them with my all-time-favorite SET amp, the S10 from BorderPatrol. This is a spectacular pairing! But that loudspeaker is so big … getting it into the listening space is one (very non-trivial) thing. Moving them out of the listening space when I need to review something else is quite another. ‘Daunting’ is a word that keeps coming to mind. Zu Audio is another direction that I also haven’t explored as much as I’d like. High sensitivity paired with large drivers tends to say all the right things to me, but alas and alack, I’ve never been able to bring a pair in-house. 2013 is supposed to change that, but my first pair from Zu probably won’t walk in the door till the back half of the year. I’m keeping my fingers crossed. There’s also the “Big Tannoy” loudspeakers, like the Westminster. Aside from being enormous (see the comments about the Volti), they’re 99dB and very expensive (not that any of this stuff is cheap). Also, my understanding is that all Tannoy concentric-driver speakers tend to also love the juice more than you’d think. Hmm. I understand that there are some really nice/new designs from AvantGarde these days that solve some of the bass integration issues of the older designs. I’m not sure any of these tweaks has solved the far-field listening requirements (rumor has it that AG speakers need a bit of space to knit the sound field together), but they’re on the to-do list. And no, I’m not seriously considering single-driver loudspeakers at this point. Anyway, that’s my problem. If you’re putting together a reference system with SET aspirations, your choices are rather limited. Happily, the speakers are the only gating item. Assuming all things are equal, a BorderPatrol will do precisely what I want it to do. I’ll just need a preamp and I’ll be done. My Thöress phono pre and TW-Acustic AC-3 turntable are ready to go. More on this soon, but feel free to chime in. I’m curious. What would you choose? Many top shelf, five figure horns have come and gone in my rig over the years but the Zingalis remain (in two separate and very different systems). Furthermore unlike most, they are adored by my male AND female friends !! As I write this I am listening to a brand spanking new pair of Zu Druid Vs powered by Cary Audio 805AE monoblocks. SET magic with a bit of juice to really make them sing. How about a Rethm Maarga or Saadhana- both are about 98db+ and the Maarga’s are definitly movable. The other end of spectrum is Klipschorn (newer models) which will tuck away in corners and go down to about mid 30s. The Rethm’s are definitely something special. They’ll never slap you back into your chair, but they are definitely among the better realizations of the single-driver cult that I’ve heard. Maybe add any of the Bastanis open baffle speakers to your list. I use the Mandala with a Soul S15, designed by Anthony Matthews and Tom Evans. Speakers are over 100db and the amp produces 15w. The volume control on my Einstein never goes past 10 to the hour mark. How about the Volti Alura? You had some good things to say about them at the last show. They’re smaller than the the Vittora. (kinda) How was the bass on the Alura? The Alura sounded really nice. Not a fan of the aesthetic, and they’re still kinda cumbersome to lug about. If I was going to “go there”, I’d hands-down go for the Vittora …. How about the Tekton Lore-S, small footprint, 8 ohms @94 db, Scan drivers, priced right? Easy to move about to make reviewing other speakers convenient. Compared to the Vittoras the WAF is high, SET setup upstairs? The Lore-S is an outstanding loudspeaker, but at 94dB, not sure that it screams “SET”. Audio Note AN/E-HE. When I owned the 2wpc Yamamoto Sound Craft A-08 45, that speaker was THE perfect match. I just couldn’t afford it at the time. I honestly haven’t seriously considered the Audio Note AN/HE speakers. Audio Note speakers are Snell Speaker concepts for their simple 2 way designs gone wild on steroids. Almost like an obsession pushing what was a modest design to its absolute limit. (During his lifetime Snell’s best effort was the 3 way AII. AIIIi I think appeared shortly after he died.) The more money you spend the more extreme it gets. About 6 years ago its most extreme limit was $150,000. I heard it at the VTV show in Piscataway NJ in a $500,000 system and was underwhelmed. Today his best speaker is $1 million. That’s right for a pair of 8″ two way speakers. The big breakthrough was discovering by accident that making the diameter of the port in the cabinet smaller improved its bass. (I’m not making this up.) He says it’s about 85% of where he wants to get it to. AV Showrooms web site has extensive videos including a factory tour and discussions with the owner Peter Qvortrup about his products. The factory tour is fascinating. It is absolutely frightful. As someone who designs and builds factories and is familiar with industrial manufacturing processes and procedures for everything from brewing beer to manufacturing high tech equipment to military standards this is one of the worst factories in the Western world I’ve ever seen. I have seen worse but not often and not many times. It’s hard to believe there is any quality control there and should he request an audit for ISO 9000 certification the auditors would probably just take one peek and walk out. If this factory were anywhere in the USA, there would also be many serious building code violations that are in clear evidence. Get a pair of vintage Altec Valencia 846a’s off of ebay for approx. 2-3k amd prepare to be amazed. 100db, 16 ohm sens. and smaller than the Volti speakers. On the one hand you could build one yourself. If you don’t have the skill to design one there’s only about a million books with detailed schematics and construction plans, somewhere there might even be a kit. There’s lots of places to buy the parts for them too like Parts Express. A SET amplifier with no feedback is the most primitive amplifier there is. The basic design has to be at least 80 years old. Assembling the parts yourself should cost no more than a couple of hundred bucks. Or you could buy one that is very similar or identical for thousands. Given your budget for speakers, I’ll bet that’s the way you will go. I put those super efficient speakers in the same category. I’m no fan of them either. You could build those yourself for a small fraction of retail too. To a real DIYer, these are not the most challenging projects. I could, and were I “handy” or inclined to become so, I might. Defeats the purpose of a “reference system” though — who the hell can verify what it sounds like? And how would anyone be able to use it as a gauge on my observations much less my tastes? 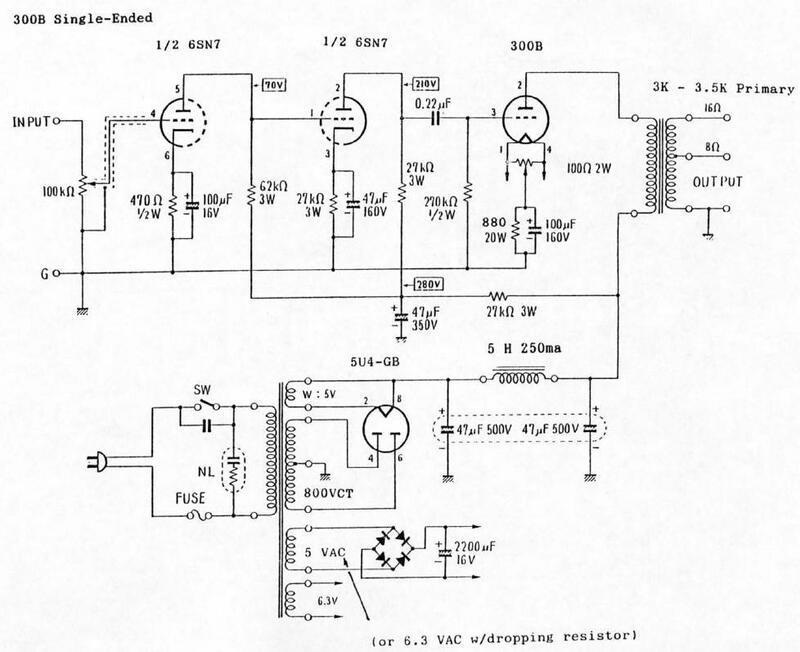 I could have built this amplifier circuit from this schematic when I was ten years old. Even back then it was an old design already. BTW, a lot of people think a 6SN7 is a great sounding tube. It should be noted that using a full wave bridge and filtering the filament supply on the 300B is critical. 300B is a direct heated cathode. 6SN7 is not but using filtered full wave DC instead of AC on its filaments as shown here can’t hurt and can only make it better by reducing hum and noise. As the power supply is unregulated any change in the power supply input voltage from the wall outlet will have a drastic effect on the thermionic emission of the cathodes. The emission varies with the square of the temperature which is directly related to the current. There is also no feedback in this amplifier so gain and other characteristics will drift as well. Your thinking resonates a lot with me because I went through the same process not too long ago: what to buy for a secondary system to explore low power amps with high sensitivity speaker setups? The Soul Supreme was a recommended choice … I need to give Sean a call. I have a pair of Zu Def 4s driven by an Ancient Audio 300b SET using Takatsuki TA-300b. Sean Casey tells me that he has a fair number of customers in the general DC area; you might find any number of Def 4 or Druid V owners willing to let you visit. Zu Audio is definitely on the list. The Living Voice Auditorium loudspeakers are wonderful — but they’re bass restricted and only 94dB. Not quite where I want to go. And the Cessaro Chopin, which I think starts at $40k, do sound great but are only 97dB. Sorry – I was actually thinking of Vox Olympians. The combination I’m listening to right now is Decware’s Suprezen 2W SET with Parker Audio 95 mkII Signature speakers (95db, 4ohm). Very nice imaging and midrange at reasonable volumes (not like my spectron driving my gallos, but…). Great for small combo jazz and vocals, less so for Brecker Brothers fusion!